Freaking out about your wedding? You’re not alone. According to a recent study by Zola, 96 percent of engaged or newly engaged couples are stressing out over wedding planning. But shouldn’t the months and days leading up to your wedding be an exciting time? Very much so! But that doesn’t mean it’s all fun and games; planning a wedding takes a lot of work. So, how can you keep your cool in the midst of it all? The biggest indicator of a healthy, sustainable relationship? You guessed it: communication. It doesn’t do any good to keep all of your emotions bottled up inside. Sometimes all you need is a moment to vent out your grievances to a friend or your fiancé. It’s understandable why you might be feeling the way that you do, and you might even find that others do, or have felt the same. Does your life now seem like it’s been consumed entirely by wedding planning? Do you feel like you can’t catch a break? If so, try to establish some parameters for the sake of your mental wellbeing. Your wedding is coming up, sure, but don’t feel like you must be doing something planning-related every. Second. Of. Every. Day. Instead, schedule out what days and times you’ll be focusing on calling vendors, researching venues, and adding up costs. You won’t believe how much better you’ll feel after a day off. Weddings require a LOT of money, and for that reason, the wedding itself can be perceived as stressful. While it’s entirely possible to blow your life’s savings on your big day, there are certainly some preventative measures you can take to avoid this. It mostly comes down to establishing a budget that includes you and your fiancé’s combined savings, what you will have saved up by the time of the wedding, and any contributions from family members—then, making sure you stick to it. Looking to up your savings in the months before the wedding? Consider a no fee savings app that’ll jumpstart your budget in no time. wedding pictures when you don’t feel like you’re at your best. To combat this stress, try to make sure you’re exercising regularly. That doesn’t necessarily mean you have to shell out the big bucks to go workout at a gym (although if that’s already the case, then kudos to you). You can get a great workout from simply going for a jog around your neighborhood or doing at-home exercises according to a workout DVD. 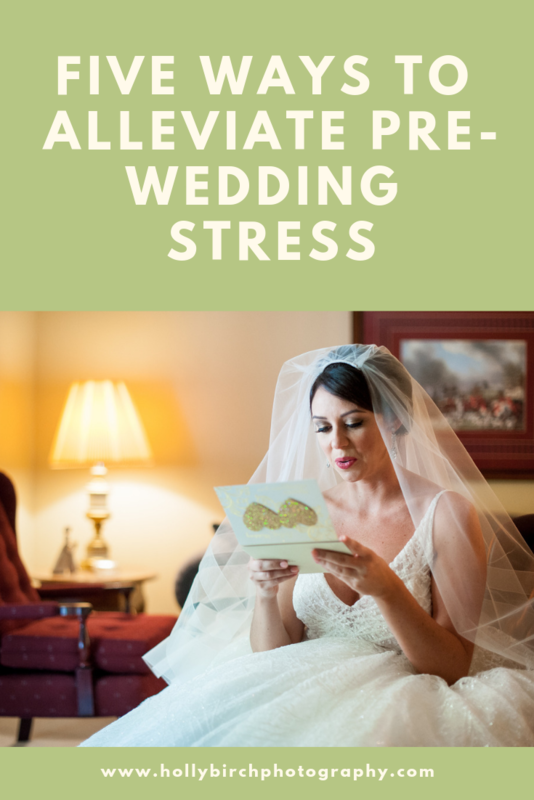 Whether you’re halfway through the planning process, or just starting out, a wedding planner or wedding coordinator (also known as a day-of coordinator) can be a huge lifesaver when it comes to easing planning stress. That’s because it’s their job to take on many of the responsibilities that are typically left to you. Planners will help you stay organized, create a wedding day blueprint and checklist, and get in contact with vendors. You can rest assured knowing your whole day will unravel according to plan at the right venue, with the best services.